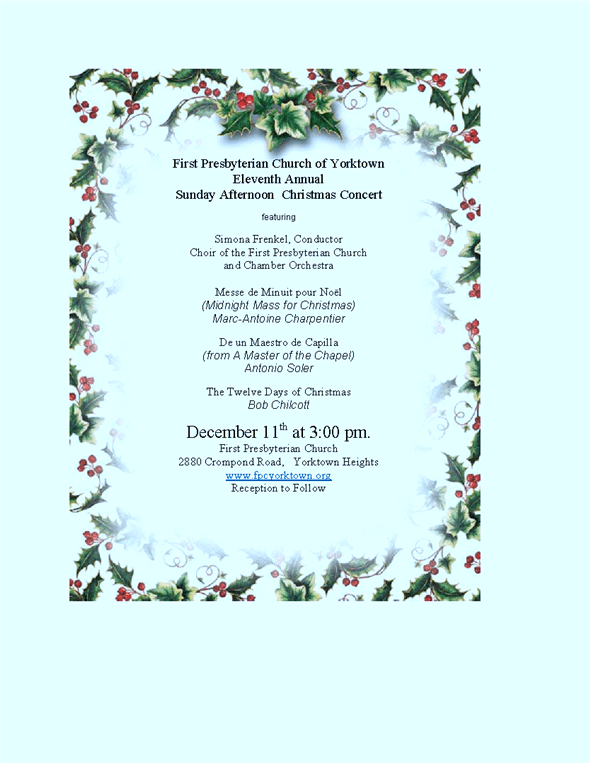 The Sunday Afternoon Concert Series presents the 11th annual Christmas Season concert on December 11th at 3:00. Conducted by Simona Frenkel, it offers a fun afternoon of instrumental and choral pieces from international composers — each of whom treat the Christmas story in a different musical style. The concert features an orchestra of seven professional musicians, choir, soloists, and extended choir family. In addition to charming instrumental music from Italy and France, the choir will be featured in three major presentations; The Christmas Messe de Minuit pour Noel by Charpentier (France) accompanied by strings and recorders, De Un Maestro De Capilla by Antonio Soler (Spain) accompanied by harpsichord and strings, and The Twelve Days of Christmas by Bob Chilcott (American “eclectic”) accompanied by piano and drums. De Un Maestro De Capilla is a mini-opera written in the 1500’s that tells the story of a boys choir and mean conductor getting ready for a Christmas concert that is suddenly faced with a storm that threatens to destroy their concert. (Sound familiar? — not the mean conductor, of course!) The piece ends with a beautiful soprano aria that returns to the sweetness of the impending birth of Jesus. Bob Chilcott’s The Twelve Days of Christmas offers a tour of musical styles with snatches of jazz, hard rock, barbershop, and opera — one for each of the twelve days! A reception will follow the performance in Fellowship Hall. Please join us for this exceptional concert!